So I recently just purchased and received my set of Kaase SR-71 heads. Here is what I've learned. 1. 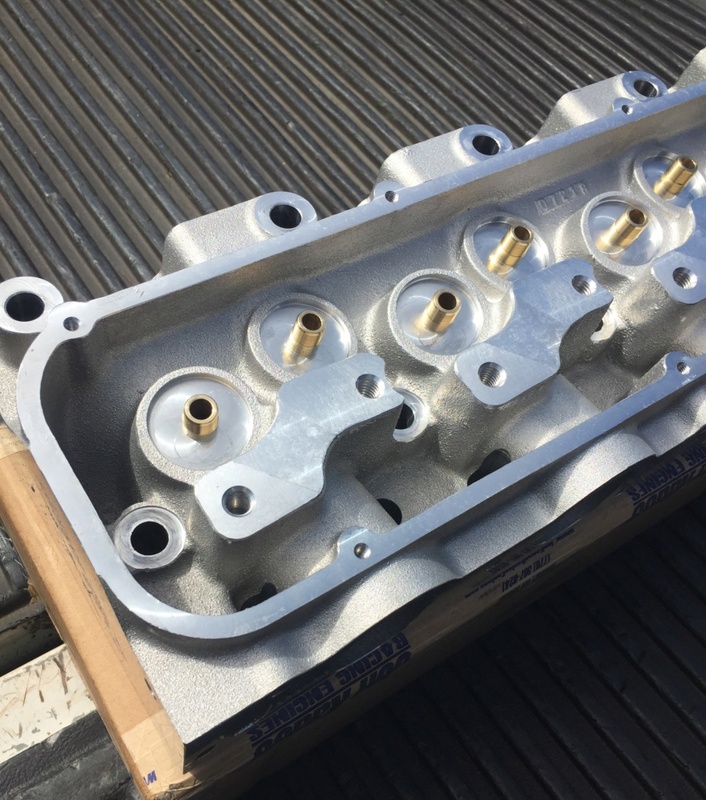 They are a conventional OEM CobraJet style of cylinder head and are simuliar in design to the P-51 heads. 2. The intake port volume as cast, to a point 1/2" below the flange is 370 cubic centimeters. This volume can be compared to that of other CJ style heads. 3. The intake port volume all the way up to the flange surface is 405 cubic centimeters. 4. The intake flange surface is extended 1/2" outward and this results in the port being raised, and thus the manifold being raised. Therefore China wall spacers are required and their thickness may vary depending on how much your block has been decked. From Kaase it is about .875" thick. 5. 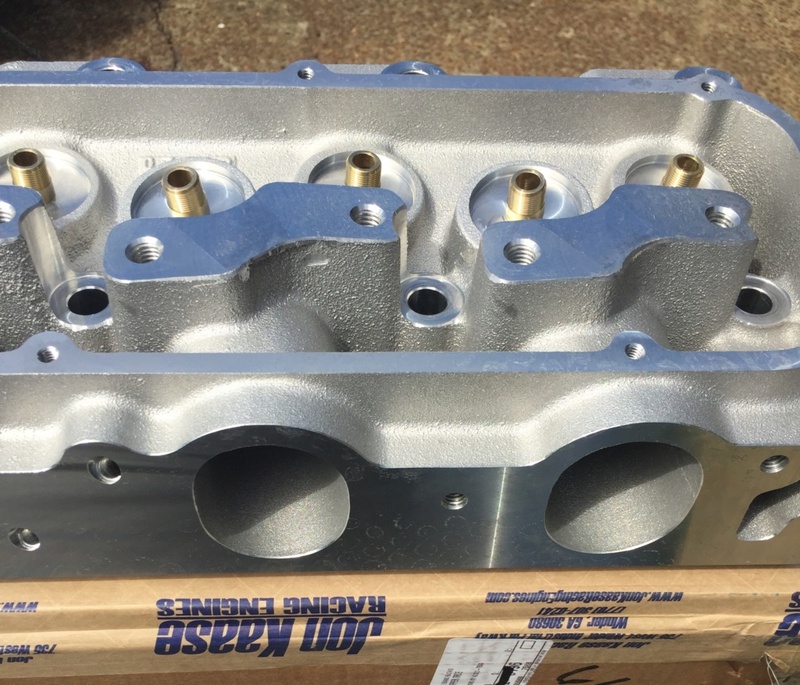 All stock style 429-460 Ford intake manifolds should fit. 6. Because the manifold is raised, check your distributor for clearance. Grind on the manifold if necessary, but most MSD distributors should clear. 7. The chambers are CNCed and have 70 ccs of volume. 8. The spark plug is more centrally located and should require no more than 26* of timing on race gas. 9. The valve pierce points are almost the same as P-51 heads, but they're spread to the outside a little bit. 10. Intake valve incline angle is 8.3* and the cant angle is 4.7*. 11. The exhaust valve incline angle is 4* and the cant angle is 3.2*. 12. The guides are the excellent quality CHE Precision guides. In # 502-340-250-E-6-A, Ex # 502-340-230-E-6-A. 13. The guide plates are SR-71 specific and they along with ARP rocker studs and the China wall spacers are furnished with the heads. 14. The rocker stud bosses are massive! They extend from the intake over to the exhaust as one big bulkhead. I know with some of the other brands of aftermarket Ford heads, people have ripped the rocker stud out of the boss, or the boss has cracked over to the outside. You won't do that with these SR-71 heads. 15. 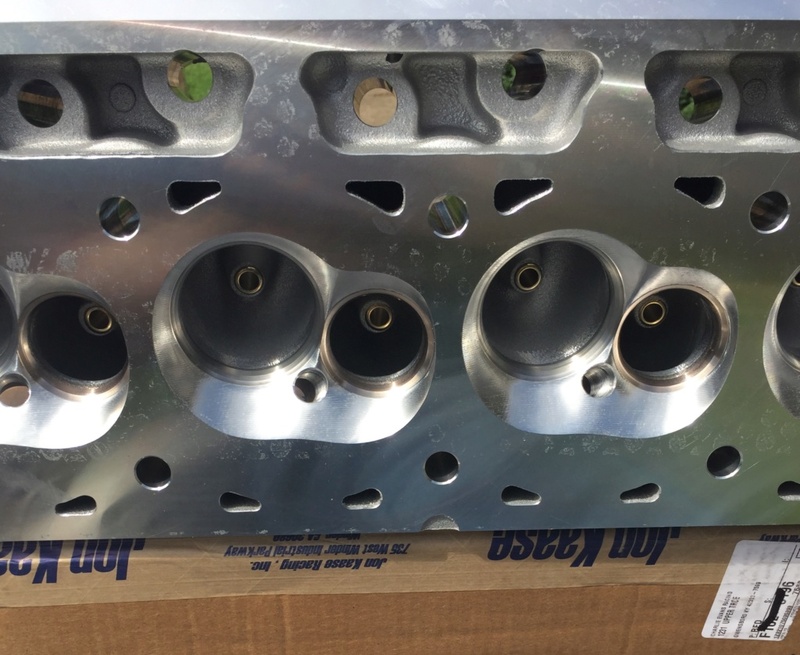 Head studs; either the regular A-429 or Edelbrock studs and you don't use a washer on the outside row, or better yet the ARP # 255-4301 for the old Blue Thunder heads. They have a longer outside row of studs. 16. IF an exhaust header bolt hole breaks through to the exhaust port, don't worry about it. Likewise if an intake rocker stud hole breaks through the roof of the port, don't worry about it. Just make sure you seal the stud hole with RTV. 17. In valve P/N 71086 EP. Dimensions 2.375" x 5.700"x 11/32" and it weighs 178 gms. 45* seat with a 30* backcut. 18. Ex valve P/N 71087 EP. Dimensions 1.760" x 5.320"x 11/32" and it weighs 126 gms. 45* seat with a tulip shaped backside. 19. The valves are longer than normal CJ or SCJ valves, because the bowls are deeper. This helps the flow. 20. The nominal intended installed height is 2.000" with a titanium retainer. 21. With the Manley # 221424 valve springs and other equivalent brand springs with a 1.070" coil bind, then .850" cam lift is possible. Intakes; .200=175, .300=260, .400=337, .500=395, .600=430, .700=443, .800=432 cfm. Exhausts; .200=106, .300=143, .400=180, .500=211, .600=232, .700=245, .800=252 cfm WITHOUT A TEST PIPE, Pipe numbers would be higher. Intakes; .200=176, .300=262, .400=342, .500=407, .600=450, .700=471, .800=457 cfm. Exhausts; .200=110, .300=148, .400=188, .500=217, .600=243, .700=263. .800=273 cfm. Again WITHOUT a test pipe. 24. These heads have outstanding flow numbers and especially mid-lift flow. I plan to use them on a NHRA Super Gas engine, where you have a throttle timer and the engine has to come up to 7200 rpm or so, in gear, after being at an idle. 25. All Jon Kaase heads are 100% made in the USA. Please don't buy Chinese copies of his heads. I hope the above information helps. Thank you Charlie for the input , knowledge and research , cant wait to see these on a big " deal !! "25. All Jon Kaase heads are 100% made in the USA. Please don't buy Chinese copies of his heads. I hope the above information helps." Could not agree more and Thanks for the info as always Charlie! bruno wrote: Thank you Charlie for the input , knowledge and research , cant wait to see these on a big " deal !! Never mind, I missed the fine print. Did I read that right? Only 26 degrees? Yes sir, 26* on gasoline. Great write up and information Charlie. I have purchased two sets of SR-71's and have third on order. We have had a lot of success with the P-51 in tractor pulling and street racing. The new SR-71 has has a lot of Kaase thought put into. We appreciate the engineering he does to utilize existing parts, that saves racers a lot of money. His knowledge and perseverance has put the big block Fords into the lime light. I agree with Charlie. Buy the real deal, not the Chinese imitations, you will not be disappointed. Jon and Cliff have been extremely good to us over the years and we appreciate it. We look forward to the awesome products he continues to bring to us. Location : Grand Prairie, TX. Angles are the same ... pierce points are slightly different; (spread apart). Yes sir, they will. I just got off the phone with Jon Best at Jomar. I will be sending him an assembled SR-71 head tomorrow, in order to make a proper stud girdle for. Charlie could you please weigh a bare or complete SR-71 cylinder head when you have a chance ? I'm trying to get an idea how they compare to a kaase Boss9 topend when you add all the extra stuff the Boss requires heavy exhaust rockers, long pushrods weight of the heads and valve covers etc..it all starts to add up..i'm thinking it could be as much as 50lbs difference from the pushrod up compared to SR-71 top end. In my opinion these heads are starting to close the gap on the Boss 9 in a 900 to 1000hp N/A deal..and I think the top end weight difference may need to be taken into consideration.. I'm showing 32 lbs bare and 38-39 lbs assembled today. Not counting rocker arms, polylocks or stud girdles. You're looking at 39 lbs for an assembled SR-71 head, and 46 for an assembled Boss head. Thanks Charlie.. for taking the time to do a great review with fantastic attention to detail . I had pretty much by passed the CJ style heads for the last 10 years for my application but this new Kaase head needs serious consideration for alot of us guys with limited engine bay room.. Great potential in this new casting I believe. Carbguy thanks for your input..I just weighed from the pushrod up my Boss9 topend..just over 63lbs.. 7/16 .165 pushrods, WW rockers, valve covers with bolts..would be interesting to see the difference with a complete Race SR-71 top end.. Big pushrods, stud girdle rockers etc would weigh..not as much difference as I thought..
nascar429 wrote: Thanks Charlie.. for taking the time to do a great review with fantastic attention to detail . You're going to be in the 25 lb range when it's all said and done. Pictures of the SR-71 heads. If installing a custom titanium valve would it be possible to increase the valve length for a 2.050 installed height could you see any problems created with valve tip or pushrod geometry?.. sorry it's a long time since I've played with a stud rocker setup. Also in the future..if shaft rocker setups T&D etc become available would the longer than standard valve length be a problem? Could these heads run a 7/16 pushrod with some clearancing? longer valves are not a problem. Also heads are at T&D now as well as Jesel and WW. We have the price planned at $2995 per pair including the ARP rocker studs and guide plates. Also with tool steel or titanium retainers they have about 2.020" installed height with the valves we supply.